Question: What will make your home smell like a scented candle from Pier One and fulfill all of your fall pumpkin spice cravings? 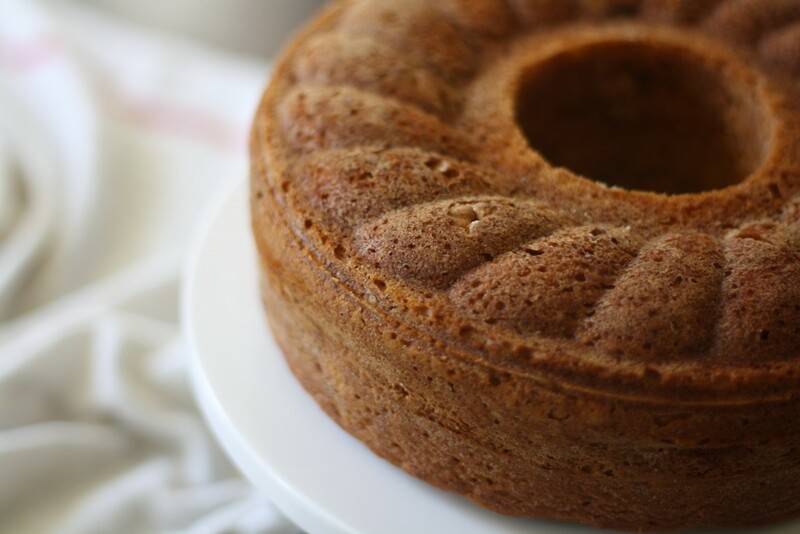 Answer: Baking and then eating this cake. I tried to hold out as long as I could, guys, but it’s been hard to avoid with everything around me turning to pumpkin quicker than one can say Cinderella. It’s always the lattes first. Then those tiny (but omg aren’t they ADORABLE?!) pumpkins make their way into the stores by the bushel. Next the seasonal pumpkin-shaped Reese’s and Snickers bars show up just to taunt me when I’m in line at the drugstore stocking up on dental floss. Oh the irony. So it was inevitable that I too, would fall victim to such deep ochre fate. I knew the minute I took a bite of this cake that there was no going back. It is always a sad day when the realization sets in that I must say good bye to popsicles for another long year. Somewhere, right now, there is a gathering of gourds mocking my fall to The Pumpkin. “It was just a matter of time. I knew we’d get her,” said the jack-o’-lantern with a laugh to his buddies in the patch. The roasted pepitas crunched as he tossed them back into his toothy grin. Perhaps I’m being dramatic. I have had four cups of coffee and it is creative writing hour over here. In addition to giving into the seasonal pumpkin mania, I broke one of my personal baking rules and made a low-fat cake. Up next: my public apology to butter. So let’s recap. 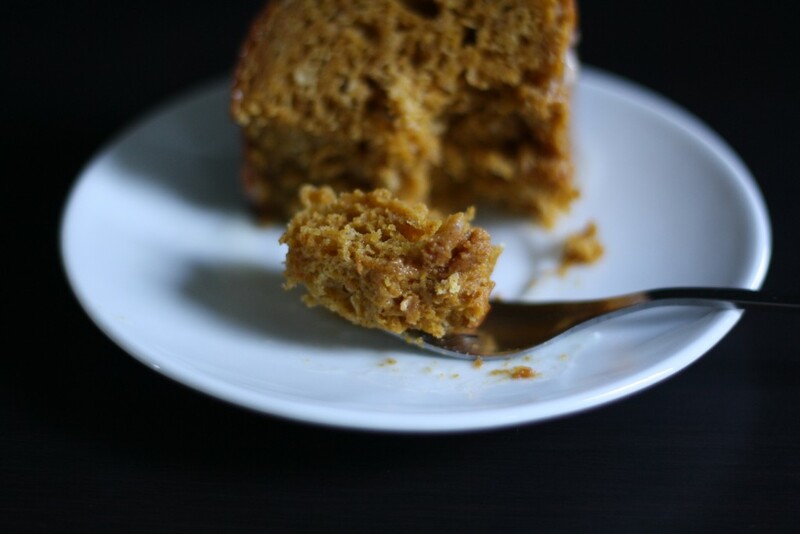 This cake is made with pumpkin. This cake is low-fat. Could it get any better? Yep. This cake comes with a free car! (Just kidding.) But this is a one-bowl cake. Full of pumpkin and spice which is all the rage these days, low-fat AND one-bowl! AHHHHH! Do you feel like you have won the lottery?!? I know friends – forget your Outlook calendar that is full of meetings for a minute – this day just got so much better. If there was a secret to this cake it would probably be that it is made with Greek yogurt which makes for a crumb that is nary a bit dry. This is a delightful afternoon cake but – just like the perfect clutch – it transitions perfectly to evening. 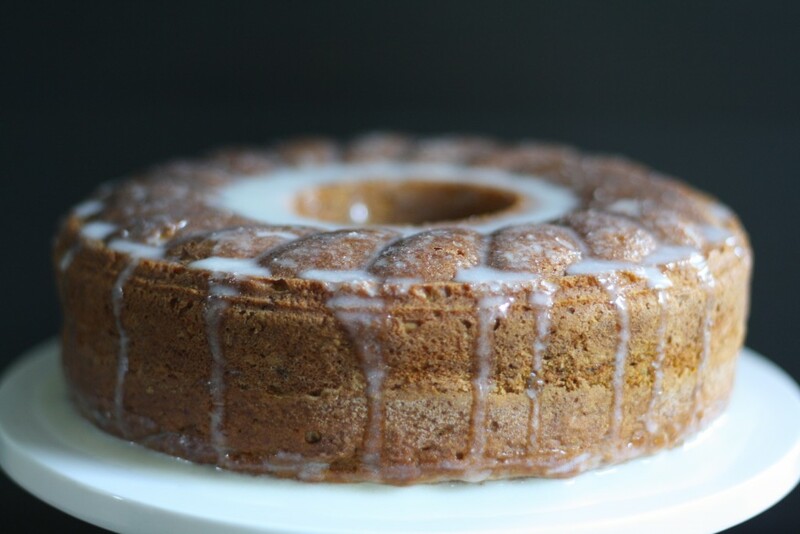 The glaze whips up in minute and all its greatness (I’m looking at you bourbon) gives this cake just a little something extra that shouldn’t be missed. If you happen to insist on keeping things legitimately low-fat then a sprinkling of cinnamon powdered sugar would be a fine substitute. So let’s all bid one final adieu to iced coffee and get pumped up for pumpkin! Preheat oven to 350. Generously butter and flour a 9-inch springform tube pan (whaaaat is a springform tube pan, you ask? It’s this but if you are without one then a bundt pan works just as well) and set aside. 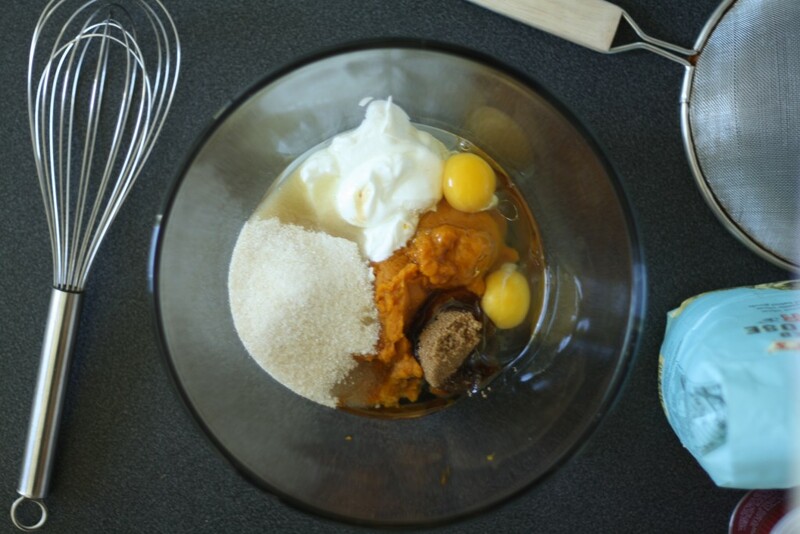 Combine pumpkin, yogurt, vanilla, eggs, both sugars and oil in a large bowl and whisk for several minutes until smooth. Set a fine mesh strainer over the top of the bowl. Make sure your bowl is high enough so the liquid doesn’t touch the bottom of the strainer. Trust me, I know from experience. 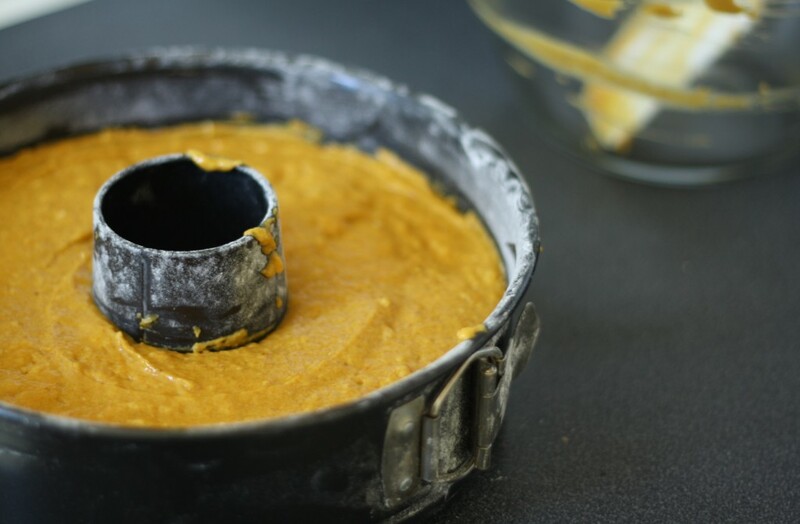 Combine the flour, baking powder, baking soda, salt and spices in the strainer and sift the dry ingredients directly over the pumpkin mixture. 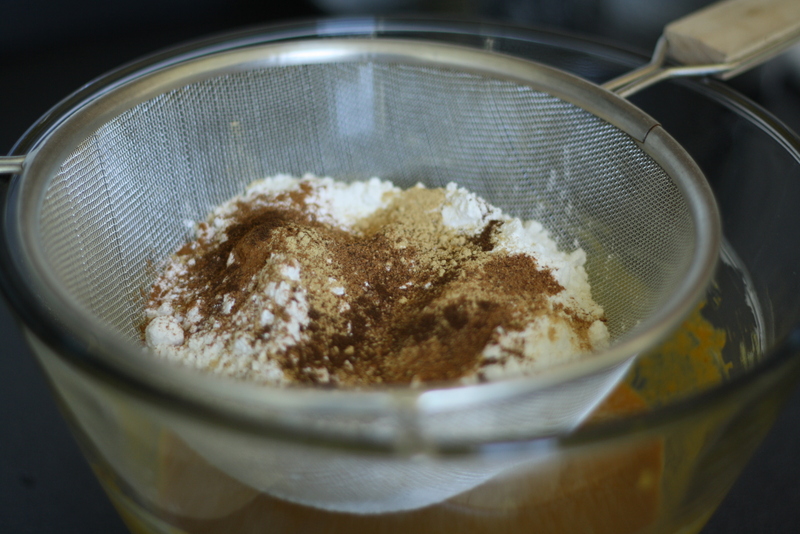 Use a spatula to fold the dry ingredients into the wet ingredients. Be careful to not over-mix. Pour the batter into the prepared pan and smooth the top with a spatula. Bake for 40-45 minutes or until a tester comes out clean. Cool in the pan for 20 minutes, then transfer to wire rack to cool completely. Meanwhile make the glaze. In a small bowl combine the cooled butter and sour cream until smooth. Stir in powdered sugar, bourbon, and a pinch of salt. The glaze will be thin (and will spread) so pop it in the fridge to help it to firm up a bit while you wait for the cake to cool. When your cake is completely cool, transfer to a fancy (and rimmed!) serving platter and spread generously with glaze. Serve immediately. I am so digging how easy this beauty is….amazing. I gave into pumpkin 6 weeks ago so I’m totally digging this. It’s okay to make the whole cake one serving because it is low-fat…right? I’m so glad I’m not the only one who doesn’t make lowfat cakes. I might make an exception for this one! Yay! This cake is worth the exception for sure! I am going to try this tonight!!! Hope it turns out well! i’m so stoked to be coming back to a country where tinned pumpkin puree is available! i’ve been making my own (and lots of it) for the past 7 years. yaaaaaay pumpkin! OK…I’ll make this while I’m boiling down some more cider…looks like I’m spending a good part of Sunday in the kitchen. Fewer dishes to do is almost as good as a free car, so this is all good. 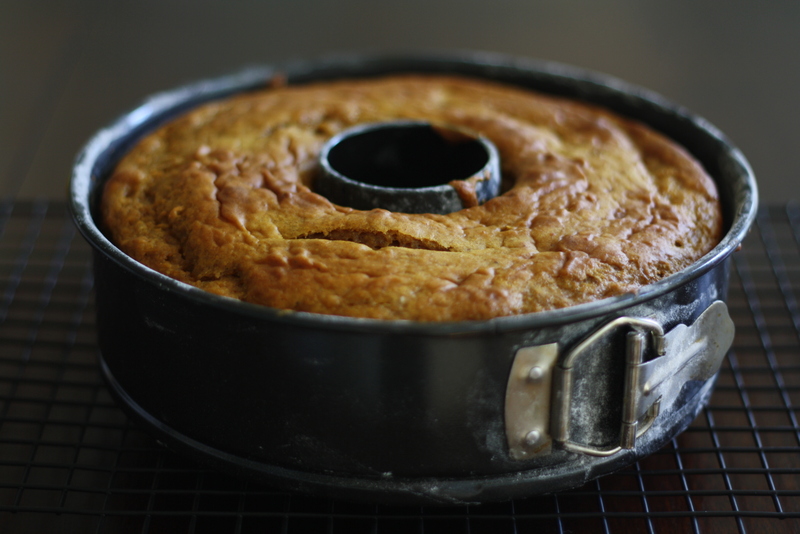 Plus, I have a pantry full of canned pumpkin so I will be making this for sure! Have you ever heard of Apple Hill in the Placerville/Camino, CA area? Well, there are about 40 ranches/orchards/wineries that sell all the best Autumn has to offer. I just came upon your blog and I am so impressed with your down home sophistication. My husband and I took photos on our excursion and we did compare ours to yours. Very fun. Anyway, I am going to print your recipe and make it now and for Thanksgiving too. It sounds mouth watering. So far I have made Susan Branch’s apple-cranberry crisp recipe (substituted red raspberries for the cranberries because they aren’t in our stores yet) and it was fabulous. I’m anxious to get cozy with all the good, spicy scents of pumpkin baking in my oven. Keep up the great blog. I love your writing too. Thanks Sheryl! I haven’t been to Apple Hill but I’ll have to check it out next time I’m in the area. Hope you enjoy the cake, and happy baking! This was such a delightful cake. It was a simple and easy process. I loved making it. Yay!! So happy to hear! 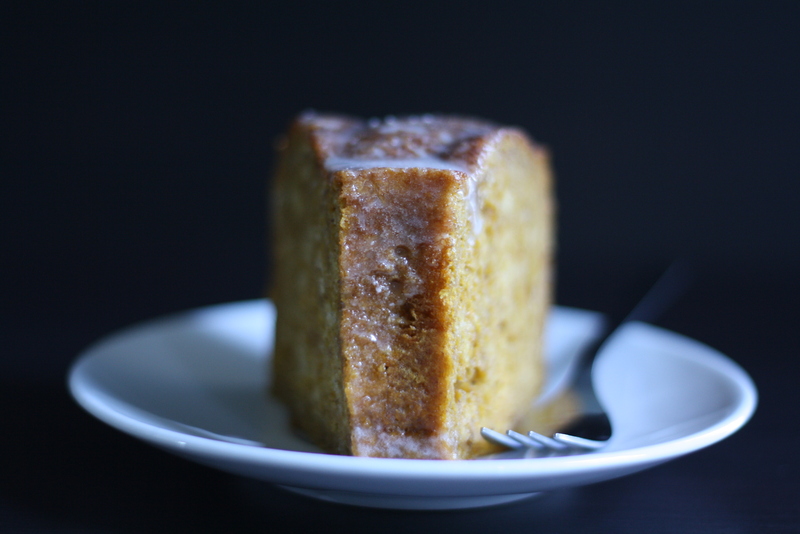 I don’t know about the pumpkin part…but cannot get over the bourbon sour cream glaze. Four words that spell out h-e-a-v-e-n !!! I read an article the other day that said bourbon should stay out of all foods– from desserts to bbq glazes– and it made me so mad! 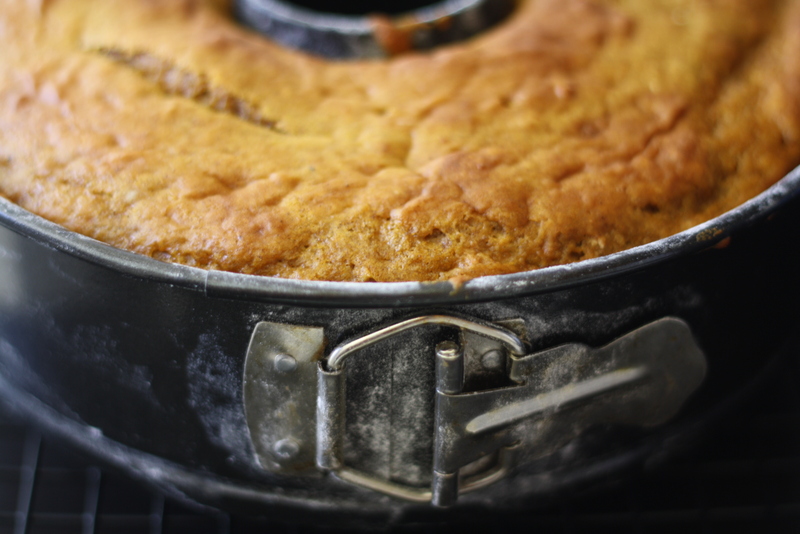 Bourbon + pumpkin cake? So, so yummy! Wow this looks amazing Just what I’ve been craving theese last days. Aww, thank you Marie! I hope you enjoy the cake! I like the way you are preparing for the month ahead! Just stumbled across your blog and am so impressed! The recipes look great and your photos are beautiful. I have big plans to make this cake tonight for dinner at a friend’s house. Hope you’re staying safe (and dry). Thank you Morgan! Hope the cake turned out well! I just made this cake last night. It was the best cake I think I’ve ever made. It was also the first recipe I’ve tried from your blog. Thank you for posting it. I can’t wait to try more of your recipes. You had me at bourbon glaze. I’ve got a party next week this would be perfect for – thank you!! Excellent! I’d love to hear how it turns out for you!